CLICK HERE to register for our NYC-compliant OSHA 10-hour Online Training. The Occupational Safety and Health Administration (OSHA) recommends Outreach Training Program courses as part of an orientation program for construction professionals. 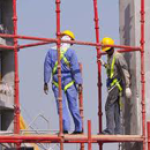 This Online OSHA 10-Hour Construction Program provides entry-level workers with critical knowledge about a variety of OSHA-regulated safety and health topics to ensure on-site safety, and covers the basics about what topics fall under OSHA's umbrella, how OSHA operates to protect both workers and employers, and how you personally can benefit from knowing OSHA's standards. Once the course is complete, the client can print out a certificate of completion immediately. This printout acts as a temporary card. The wallet sized OSHA card will be mailed within 6-8 weeks after completion. Windows XP or Windows Vista is recommended, Microsoft Internet Explorer is recommended. Other browsers, like Firefox or Safari, might result in non-optimum results. Please Note: OSHA regulations state that a student can not spend longer than 7.5 hours in a OSHA 10 course per training day. Please allocate a minimum of two (2) calendar days to complete this training. ClickSafety’s online learning management, compliance and documentation solutions help organizations execute their training objectives and build world-class safety cultures. Since 1999, ClickSafety’s training solutions have been deployed to over 10,000 organizations worldwide, including leading construction, general industry and engineering firms. Its safety training solutions are flexible, customizable and interactive, presenting a "student-centered" approach that is designed to enhance learning and retention. ClickSafety has established a reputation for providing industry-leading safety training to the country's premier construction and general industry firms, enabling them to build sustainable safety cultures. Its partnership with IACET and adherence to the ANSI/IACET 1-2013 Standard addressing the Design, Development, Administration and Evaluation of our safety course development program is a demonstration of its commitment to lifelong learning and high standards for education during an individual’s entire professional career. ClickSafety was the first OSHA Outreach Training Provider to deliver both the OSHA 10-Hour and OSHA 30-Hour safety training courses online. Today, ClickSafety employs an in-house team of Certified Safety Professionals (CSP), Certified Industrial Hygienists (CIH) and other industry professionals to create and maintain the most comprehensive and up-to-date catalog of online safety training courses available. ClickSafety is headquartered in Walnut Creek, California, and offers over 300 interactive training courses, including more than 55 courses in Spanish, to help organizations promote and foster a strong safety culture.